Shelly Benisch from CIS sheds some light on the commercial insurance industry. When people hear John and I married right out of school and now partner an insurance agency, we’re amused with questions of how we keep from killing each other! While we have our moments of healthy debate, we truly believe we work best as a team which is similar to what we hear from the most successful Expedite partnerships out there. When respect and trust are in play, all partnerships can confidently succeed if they’re shooting for the same goals. Can you give us a little history about CIS? I started CIS in 2002 writing all kinds of commercial insurance from warehouses to auto dealerships to trucking risks. Early on I realized that there were a lot of agents writing truck insurance who didn’t fully understand it any more than I did…and I didn’t want to continue to be one of them. So in 2005 I achieved my “CIC” (Certified Insurance Counselor) designation which allowed me to continue higher education in Truck Insurance. That stepping stone took me to the Motor Carrier Insurance Education Foundation where I obtained my “TRS” (Transportation Risk Specialist) designation and where I also serve as a Board Advisor. This was actually interesting stuff to learn and as my education continued and my Expedite Freight niche continued to grow, John saw how much fun I was having and he jumped on board! With such a long history in this industry, what are some of the biggest changes (or challenges) you’ve seen in recent years? Undoubtedly it’s the “multi” or “independent” model where Owner Operators provide their own insurance vs the Motor Carrier providing the insurance. The continuing educational background listed in the prior question is how I know about the potential gaps that can and do occur under these alternative models, not to mention the ongoing changes within FMCSA… and why both John and Christina in our agency both have their TRS designations as well. What are some ways our industry can overcome these issues? I spent the last two years as Insurance Advisor for TEANA going out and educating Brokers, Shippers and 3PLs about the risk exposure they have when incorrectly insured Owner Operators haul their freight. It’s safe to say our Expediting Community is now aware of the risk as we see more spot check verification of coverage on a per unit basis. How important are Owner Operators? You said above “It’s all about the Owner Operator for a number of reasons”…what other reasons? 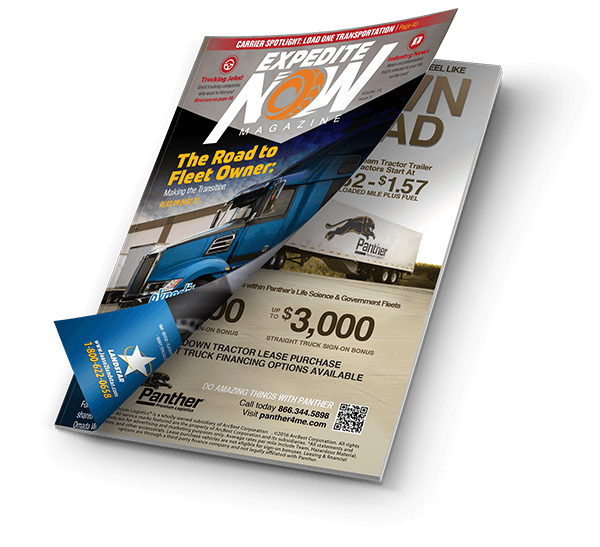 Everyone knows that there aren’t enough professional drivers out there, but what they might not realize is that some Motor Carriers are allowing their Owner Ops to go onto bid boards to bid their own loads. New contracts are also being developed where the Owner Operator has more of a “per trip” lease vs continuous lease. The “uberization” of freight in some form is on the horizon, and handheld apps will offer the ability to expand the option of Owner Ops bidding on loads under various lease contracts. It will not be identical to Uber taxi, and it will not completely take out the majority of traditional freight arrangements… but there will be some changes to our industry. All this gives the Owner Operator more power and a better bargaining position, but they also need to be properly insured so they don’t find themselves tossed aside should an uncovered accident occur. It’s understandable that Motor Carriers want to work with Owner Operators they can trust. So what is the overall concept for CIS as these changes occur? Owner Operators are the lifeblood of CIS. We work as their advocate to help them succeed by working in a partnership of mutual respect and mutual goals with their Motor Carriers. In the end doesn’t everyone really just want to haul more freight safely and profitably with an avenue to a secure future? How does CIS help solidify this long-term trust and relationship? We promise “CIS Certified Monitored and Verified Independent Contractor Policies” for preferred Owner Operators. We notify the Motor Carrier in real time when there is a change in his Owner Operator’s insurance coverage. We know of no other Agency who offers this free service, which is amazing because it’s so important. Can you further explain how that helps the Owner Operator? When a Motor Carrier is confident that correct coverage is in place at all times, they can also be confident in securing the position and preference of that Owner Operator when loads are issued. Is a Motor Carrier making money when he’s calling an insurance company to double check whether or not insurance is in place on the Owner Op? Of course not. We believe the Motor Carrier can better utilize that time obtaining more loads for the Owner Op which translates into more runs, more money, and more security… for everyone. Anything else you’d like our reader to know?